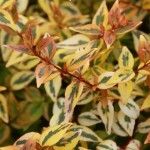 A compact shrub, selected for its leaf color and dense habit. 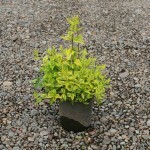 The new leaves are lime-green with bright yellow edges, maturing to a golden edge in summer. As the weather cools, the colors are a bright combination of red, orange, yellow and green. Small white flowers bloom throughout the summer. 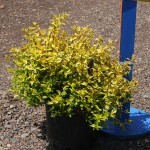 Excellent in containers, mass planting or where a bright spot of color is needed. It prefers full to part sun to promote bright color. Prune it as needed from spring to late summer. It is deciduous in zone 6. PP 16,988.